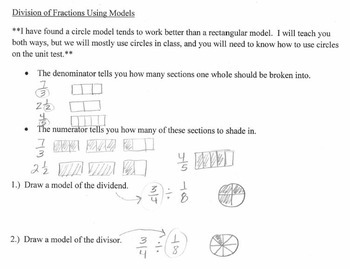 Sixth grade math notebooks covering the complete sixth grade math common core curriculum. 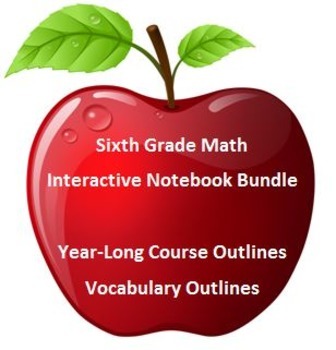 This is a bundle of our two interactive math notebooks. These math notebooks allow our sixth grade math students to write down math notes AND vocabulary during class in an organized format. Click on the links below in order to see the description of these individual products, the table of contents for the entire course notebook, and master list of vocabulary words. We use these interactive notebooks as a way to meet all of our students’ needs. Pre-written for the student is the outline that can take so long to write in class. During class notes, students only need to write down an example of the concept being taught. 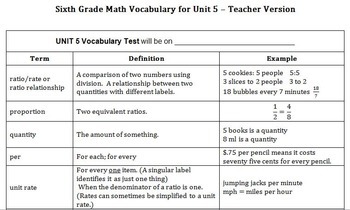 When new math vocabulary words are introduced, students are expected to write examples on their version of the outline. Keys are provided for both notebooks. 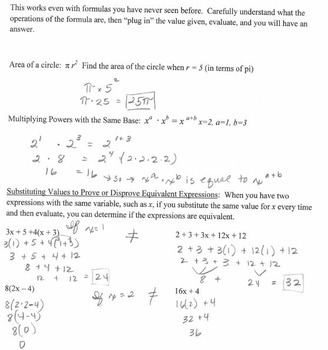 Click on the link below for spiraled math review worksheets. These worksheets provide practice with error analysis and answering multiple choice questions that have more than one correct answer, as well as practice answering lower-level mathematical questions.